Laura of Hey What's for Dinner, Mom? proposed a home made Valentine's exchange between a handful of bloggers! I enjoy being crafty and receiving mail, so I happily said yes! My doily Valentine from Laura! My paper art valentine from Monica of Lick the Bowl Good! It was fun to re-visit an old favorite of making Valentine's by hand, which I haven't done in ages! So sweet! You had it good as a kid. I love that picture of you making Valentine's. so cute! THank you for my Valentine! SCARY-I made pork in the crock pot the same day! 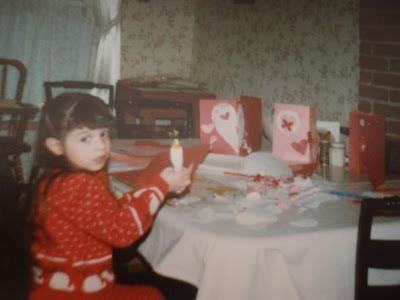 and yes you were cute and loved crafts.